In recent years, Quaker parrots have become more and more popular as pets around the world, and if you know anything about this interesting species, then it's no wonder why! Often referred to by their owners as "clowns" or "jesters," Quaker parrots are known for their fun-loving, comical personalities and their energetic, spunky nature. While they aren't the best pets for just any bird lover, for the right person, a Quaker parrot can make a ​wonderful loving and affectionate lifelong companion. Read on to learn more about what it's like to share your life with one of these special birds, and you'll get a better idea of whether or not a Quaker parrot might be a good choice as a pet for you and your family. While they are most commonly referred to as Quaker parrots, these birds are often referred to by a variety of different names. In addition to their most common moniker, these birds are often called Quaker parakeets, Monk parrots, and Monk parakeets. Thanks to selective breeding, they are now available to pet owners in a wide variety of color mutations, but they are all variants of the same species, Myiopsitta monachus. Quaker Parrots Can Live for a Very Long Time. Like many parrot species, Quaker parrots can enjoy a particularly long lifespan in captivity. When well taken care of, some Quaker parrots can live for more than 30 years. This can be quite the time commitment for anyone, but especially for new and inexperienced bird owners, so Quaker parrots are often not recommended for beginners. They are a very social species which can form solid bonds with their owners, so it is difficult for them to handle being bounced from home to home. Please don't adopt a Quaker parrot unless you are certain that you can commit to caring for one for 20 - 30 years or more. If you're looking to adopt a talking bird, then a Quaker parrot might be right up your alley. Quakers have been prized for years due to their exceptional talking abilities. Not only can they learn a diverse vocabulary of words and sounds, but they also tend to be able to speak very clearly, and often rival even larger parrot species in terms of the clarity and pleasant tone of their voices. 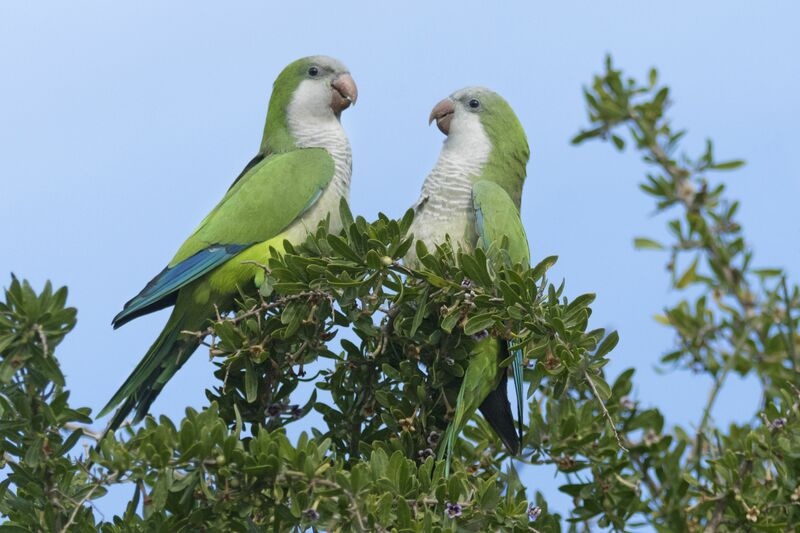 While not every Quaker parrot is guaranteed to talk, individual birds have greater odds of excelling at mimicry than birds of many other species. Often, those who are interested in owning a parrot are deterred from adopting one because they think that all parrots are large birds who need vast amounts of space that they can't provide. Well, the Quakers are just one of many types of medium-sized parrots that prove that notion wrong! While it's true that all parrots need as large a space as possible in terms of their cage and room to play, Quakers and similarly sized species can do well with considerably less space than a species like a large Macaw. This allows even those who live in cozier quarters to enjoy the companionship of a parrot if they so choose. Like some other bird species such as Cockatoos and Amazons, Quaker parrots have a tendency to become overweight if their diets aren't closely monitored. In addition to a high quality and balanced commercial seed and pellet mix, Quaker parrots should be offered a variety of fresh foods daily, including fruits, vegetables, and leafy greens. Care should be taken to ensure that they aren't allowed to overindulge on things like sunflower seeds, peanuts, and millet -- all of these treats can cause rapid weight gain if a bird isn't closely monitored.